As a way to increase the profile of school trustees as the election approaches, BCSTA launched the #ProudToBeASchoolTrustee social media campaign at our 2018 AGM. Members have been encouraged to share messages on social media about why they are #ProudToBeASchoolTrustee, including why they decided to run as a trustee, the work they are most proud to be involved in and the impact of their work in their communities. We encourage everyone to use the hashtag, participate in the campaign, and spread the word about the important work of school trustees. BCSTA has also hosted a collection of relevant materials for candidates online, accessible here. 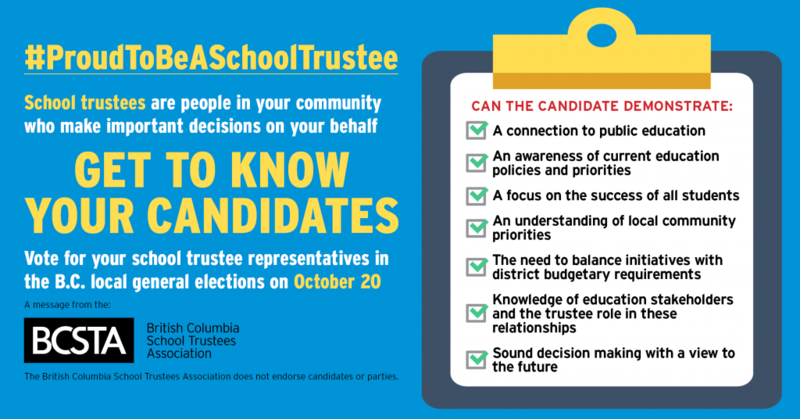 On September 21, BCSTA shared the following graphic on social media, highlighting the importance of encouraging the public to learn about their local candidates, along with emphasizing some key features to look for in potential trustees.